The P2 Rating test will comprise a written test and a practical flight test. Unlike the P1 Rating, there is no exemption for experienced pilots from taking the P2 flight test. Register the student in the Student Training Record System (STRS), if not already registered. Enrol the student on the P2 Rating Test in the STRS. The written test comprises a series of 21 multiple choice questions which are displayed on the test web page in the STRS. The questions are selected at random from a database of 66. It is very unlikely that any two students will receive the same set of questions. The student is allowed 30 minutes to complete the 21 questions. There are pop-up warnings given at 5, 2 and 1 minutes before time-out. If the attempt is valid, he will mark the exam and return the result to the student within 24 hours if possible, and 48 hours maximum. The pass mark for the written test is 16 correct answers (76.2%). Depart from Biggin Hill EGKB and proceed in a generally north easterly direction passing instructor-defined waypoints before turning north and positioning for an approach and landing at Stansted EGSS. Depart from Gloucestershire EGKB and proceed in a generally north easterly direction passing instructor-defined waypoints before turning north and positioning for an approach and landing at East Midlands EGNX. The selected route will be given to the student in a written preflight briefing at least 24 hours in advance of the flight test. The student will prepare the flight plan, and carry out a weight and fuel calculation, plus any other "desktop" tasks required to conduct the flight competently, and email this information to the instructor, in advance of the flight test. The student will be connected to VATSIM throughout the test. The flight will be conducted with at least two VATSIM Controllers on line. Students will be expected to communicate with these ATC stations throughout the flight. 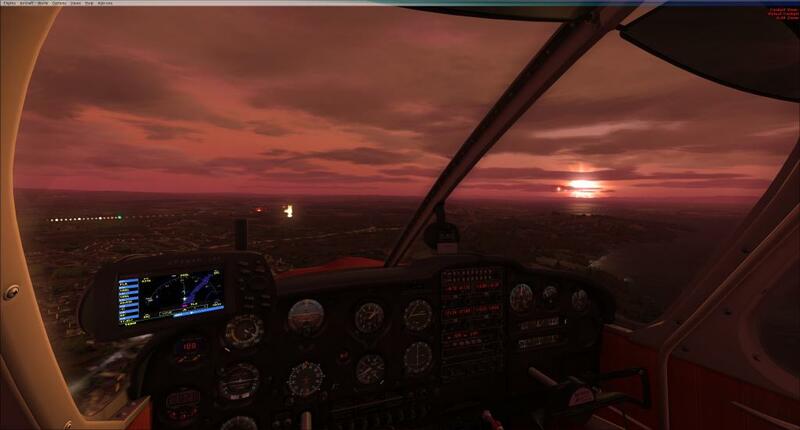 If the Flight Test is to be carried out in FSX shared Cockpit Mode (the preferred option), the Training Administrator will advise the student where to find the shared cockpit instructions, so that they may adequately prepare for the test. If requested by the student, prior to the test date, the Training Administrator will assist the student to set up shared cockpit, and provide information on how to log into the Club TeamSpeak server. The Student will also be told how to access the Student Training Record System to view the results of both the written and flight tests. By means of the software tool "Teamviewer". The flight will be conducted under Visual Flight Rules, and will normally be carried out in the default Cessna 172. An alternative aircraft in the "Light" category (less than 5,700Kg MAUW) may be used by prior agreement between the examiner and the student. The Flight is primarily designed to test the student's knowledge of his aircraft and flying within the VATSIM environment. It will concentrate on aircraft handling, knowledge of aircraft systems, simple assisted visual navigation and ATC dialogue. 10 minutes debrief including a statement of pass or fail. The student and Examiner will communicate with each other via the Club's TeamSpeak server. If the student passes the flight test, the Examiner will normally update the VATSIM Member database as soon as the test is completed. If the student fails the flight test, he will be advised that the Club can offer training to assist in achieving a pass at a subsequent attempt. Maintain altitude, heading and airspeed within defined limits for a specific period of the flight. Each of the six sections must be passed in its own right with a score of 4 or more. ADVANCED PASS: A score of 5 or 6 in each of the six sections. Total 30 or more. PASS: A score of at least 4 in each of the six sections. Total 24 to 29. FAIL: A score of 3 or less in any one section. Certain actions will constitute an immediate fail.